Late last month, in October, Eminem's manager revealed the first details of the Detroit rapper's new album. Little is known about REVIVAL right now though that could soon change with Em due to perform on Saturday Night Live on November 18. On Wednesday night, November 8, the rapper also posted what looks like the title of the album's lead single on Instagram. Using the same font and style as the spoof medical ad in which Paul Rosenberg revealed the album title, Em's post shows a doctor's note with the phrase "Walk On Water" alongside a reminder to "Take as needed." There is nothing confirmed from the Shady team. The FADER has reached out for clarification. 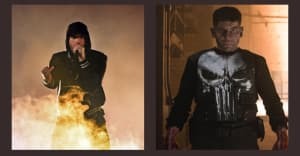 The medical theme has run throughout Eminem's recent activity. When rumor of a ninth studio album first emerged in October fans discovered a website for a medication called “REVIVAL,” where the “E” is backward in the signature Eminem style. There are subtle hints all over the site including the phrase “REVIVAL could be music to your ears,” and “seek medical attention, ‘I need a doctor’" a possible reference to Eminem’s song with Dr. Dre. There’s even a working phone number (1-833-243-8738) for the fictional product where callers can hear a recording say “you only get one shot to beat AR” with “I Need A Doctor” playing in the background.